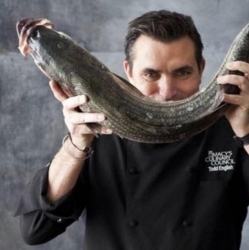 Creative eating may never be the same thanks to a strategic partnership announced today between world-renowned Chef Todd English and Emko, the creative events site and gallery space located in the South Dixie Corridor, two blocks away from the newly renovated Norton Museum scheduled for reopening on February 2019. Chef English, a TV personality, author, restaurateur and lifestyle entrepreneur, and Emko have teamed up to transform the dining and entertainment experience for our local community. The Todd English Experiment is open to the public for dinner from Tuesday through Sundays. The first epic dinner experience with Todd as part of the series for the season 2019, “Flavors of the World” is scheduled for Mid February. As part of the new partnership, Chef English will introduce a concept, called The Todd English Experiment. With a focus on eating well, Todd English will offer a delicious, Modern American menu, featuring English’s signature and best curated American tastes and flavors. Todd English has been breaking boundaries his entire career, and Emko looks forward to an innovative approach that they believe will amplify the dining environment. By bringing together Chef English’s award-winning brand and cooking advocacy and Emko’s commitment to enriching and nourishing our community through creativity, Emko has an opportunity to elevate the on-site dining experience and off site catering /events with a unique concept that offers guests a greater variety of culinary options. The restaurant design and aesthetics convey a calming, rustic at-home cooking vibe. Todd English’s menu is a casual Modern American concept. The menu features the best curated flavors and tastes from his career and also flatbreads and pizzas that you can enjoy directly at your house with Emko’s delivery service.